Providence, RI (5/24/2013): Two key defensemen, who as young players helped the Reds surface from under the depths of three consecutive years of losing in the late 1960s, have been selected to receive the Rhode Island Reds Heritage Society’s most prestigious annual honor – the "Tops Award," named in memory of Zellio Toppazzini, arguably the greatest player of all time to wear a Reds uniform in the club’s fabled 51-year history. Wayne Muloin and Ray Clearwater will receive the Society’s 2013-14 awards at the organization’s 13th annual reunion On Sunday, August 4 at the historic carousel building at Goddard State Park in Warwick, RI, where all previous reunions have been staged before sellout crowds of 300 players and fans. At age of 24, Muloin came to the Reds via trade in 1965-66 in the midst of the Reds worst three consecutive seasons of losses, totaling 146. Clearwater, just 23, joined Muloin the next season on the rookie blueline. Signature strength of Muloin was the long lost art of the effective hip check and a knack for team leadership. Clearwater provided timely defensive poke-checking and productive offensive rushes. Both could move the puck cleanly out of the defensive zone and each had skating skills to advance the play on their own. American Hockey League defensemen. 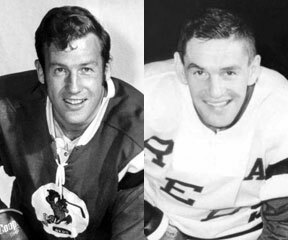 The now deceased Marcel Paille, their goalie who had been bombarded throughout the long three-season losing streak, was the first to appreciate the relief the talented “two kids” and two veteran blueliners provided. In fact, in 1967-68 the Reds made the playoffs for the first time in three seasons, led by player-coach and AHL MVP Dave Creighton and the team’s stalwart defense corps. In the Calder Cup playoffs the Reds then toppled the Springfield Kings in the first round, 3 games to 1, but eventually lost in the cup semi-finals to the Quebec Aces, 3 games to 1. After spending four seasons together as teammates on the Reds, Muloin and Clearwater rejoined as partners when they signed on for three seasons with the fledgling World Hockey Association’s Cleveland Crusaders in 1972. Notable teammates there were goaltender Gerry Cheevers, ex-Reds Larry Hillman, Joe Hardy, Jim Wiste, and the now deceased Jack Hanna. And though he is not an ex-Red, let’s not forget our own current R. I. resident, Rich Pumple and former Providence College star. The “Tops Award” has two basic important criteria that fit both Muloin and Clearwater: The demonstration of outstanding service to the Rhode Island Reds hockey club and the goodwill donation of time and effort within the broader community, just as did Zellio “Topper” Toppazzini. Over 100 tickets already have been sold to the August 4 reunion. Tickets are $35 for adults; $15 for children ages 6 -15; and no charge for children under age six. Reservation deadline is July 15. Tickets will not be sold at the gate. For further information call 401-247-2666 or e-mail UNH1959@aol.com.